1. To make the lemon sugar, mix the caster sugar with the rose petals, cardamom pods and lemon zest. Tip it out onto a tray lined with baking paper to allow the lemon zest to dry out. Leave for a couple of hours at room temperature and then transfer to a sealed container. You can also add a whole vanilla pod. This can be made up to a week in advance. Remove the two whole cardamom pods and vanilla pod before using. 2. Pre-heat the oven to bake the cheesecake to 180C. 3. Using an electric beater or a stand mixer with a paddle attachment, beat the butter for five minutes until it is pale and creamy. Remove the cardamom and vanilla pods from the flavoured sugar and slowly add the sugar to the butter, beating until incorporated. Add the vanilla bean seeds from the pod, or one teaspoon vanilla extract and beat again. 4. Add in the egg yolks, one by one and mix until incorporated. 5. Add both the curd cheese and the ricotta cheese and beat well until smooth. 6. In a separate clean bowl, whisk the egg whites to stiff peak stage. Once stiff, using a metal spoon gently fold the egg whites into the creamy cheese mixture. Stir in the cornflour or potato flour and the poppy seeds. 7. Take a 20cm round spring form cake tin, grease the bottom and sides and line the bottom with a circle of baking paper. Pour the cheesecake mixture into the tin. Wrap tin foil around the outside and bottom of the tin to protect any water from seeping in when baking in a bain-marie. 8. Take a large roasting tin and half fill it with water to create a bain-marie. Gently lower the foil wrapped tin into the water and bake for one hour. The top should be golden and the centre a little wobbly but not too much. 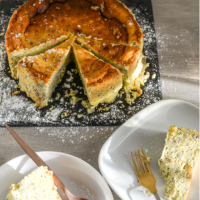 Leave the cheesecake to cool completely before releasing it from the tin and chill in the refrigerator, preferably overnight before cutting and serving. Keep any leftovers covered in the fridge for up to three days.